The Life And Music Of Robert Schumann Schumann's entire being was music, informed by dream and fantasy. He was music's quintessential Romantic, always ardent, always striving for the ideal. Learn about his passionately creative but troubled life, and hear some of his best music. Robert Schumann was a German composer and critic born in Zwickau on June 8, 1810. A quirky, problematic genius, he wrote some of the greatest music of the Romantic era, and also some of the weakest. Severely affected by what was most likely bipolar disorder, he achieved almost superhuman productivity during his manic periods. His life ended early and miserably with a descent into insanity brought on by syphilis. He did his best work when younger, in small forms: piano pieces and songs. Schumann's bookseller father was also a novelist and translator of Walter Scott and Byron; highly nervous, he married a violently passionate woman, and Schumann was brought up in an environment both literary and unstable. He began piano lessons at seven, and studied Latin and Greek in school in Zwickau, developing a keen interest in literature and in writing as he entered his teens. He continued to develop as a pianist and wrote novels. When he was 16 his father died and in the same month his sister committed suicide. His father had stipulated that for Robert to receive his inheritance he had to take a three-year course of study at the university level, and the next year Schumann enrolled as a law student at the University of Leipzig. He spent his time reading Jean Paul Richter and soon became a piano student of (and border with) Friedrich Wieck, whose daughter Clara, then nine, he would eventually marry. He developed a consuming interest in the music of Schubert, which opened a window on his own creative yearnings. In 1830, Schumann opted out of law and resumed his studies with Wieck. Despite incessant practice, he never became the virtuoso pianist he hoped to be, owing to a "numbness" in the middle finger of his right hand. The problem may have resulted from his use, over Wieck's objection, of a splint contraption to strengthen the hand, or from mercury poisoning related to the treatment of syphilis, which he probably contracted in his teens. Fortunately, he would not need to be a virtuoso — because he married one. The 1830s were turbulent for Schumann. He fought with Wieck over his training and his relationship with Clara, which Wieck opposed. Under stress, he drank and smoked heavily and suffered his first bouts of depression. Gradually, Schumann let go of the dream of keyboard virtuosity and became active as a critic, for which he was, during his lifetime, as well known as he was for his music. Simultaneously, he developed into quite a capable composer. In 1834 he founded the Neue Zeitschrift für Musik, turning it into a platform for his philosophizing on the music of the past and present and for notices and analyses of new works. Among his own important works of the decade were the majority of the pieces that established his reputation as a composer for the piano: Carnaval, the Davidsbündler Tänze, the Symphonic Etudes, the Fantasy in C, Kinderszenen (Scenes from Childhood), Kreisleriana, and others. During this time, he befriended Chopin and Mendelssohn. By 1840, Clara Wieck, 20, was a distinguished pianist and had been in the public eye for more than a decade. Schumann's marriage to her — which took place a year after he prevailed in a lawsuit against her father — resulted in an enormous creative outpouring. First came the "year of song." Anticipating marriage in a decidedly lyrical state of mind, Schumann focused his pent-up emotion on vocal music, composing nearly 140 songs in 1840, most of them in the anxious months before August, when the marriage permission suit he and Clara had filed against her father was decided in their favor. The following year, in a mood of celebration, he turned to the orchestra. His works included two symphonies — No. 1 in B-flat and No. 4 in D minor — as well as Overture, Scherzo and Finale, and a Fantasie in A minor for piano and orchestra. In 1842 Schumann focused on chamber music, composing three string quartets, the often heard Piano Quintet in E-flat, and the wonderful Piano Quartet in E-flat. Such feverish concentration on a single genre at a time can be seen as typical manic behavior. The other side of the coin — phobias and terrifying slides into depression — turned up as the 1840s wore on, leaving the composer incapacitated. At the end of 1844 Schumann and Clara moved to Dresden, at one of the lowest of his low points. During his next few years, he completed the Piano Concerto in A minor, his Symphony No. 2 in C, his one opera, Genoveva, and an extraordinary dramatic poem based on Byron's Manfred. In 1850, Schumann accepted a position as municipal music director in Düsseldorf. One of the first works he composed after his arrival was the Symphony No. 3 in E-flat, the Rhenish, inspired by the majestic Cologne Cathedral. During the three seasons he held the job, Schumann experienced difficulties with city administrators and ultimately, owing to his increasingly erratic behavior on the podium, lost the respect of the orchestra and chorus. He was fired in the fall of 1853. A bright spot during that sad season was the time the Schumanns spent with the renowned violinist Joseph Joaquim and the 20-year-old Johannes Brahms, whose budding genius Schumann immediately recognized. During the winter of 1854, Schumann's insanity manifested itself dramatically: He heard "angelic" voices that quickly morphed into a bestial noise of "tigers and hyenas." On a February morning he walked to a bridge over the Rhine and threw himself in; he was rescued by fishermen. Insisting that for Clara's protection he be institutionalized, he was placed in a sanatorium. His doctors prevented Clara from seeing him for more than two years, until days before his death. Schumann's literary sensitivity and introspective nature led him to imbue nearly everything he wrote with personality — in the case of his best songs and piano pieces, often the multiple sides of his own personality. Nearly all of his piano music is referential, attempting to embody emotions aroused by literature or to characterize actors' interactions in some ongoing novel or lyric poem of the mind. One of Schumann's favorite conceits was the "Davidsbund" ("Tribe of David"), peopled by imaginary characters who, like the biblical David, were willing to stand up to the artistic Philistines of the day. The members of this society included Meister Raro, probably an idealization of his teacher and father-in-law, as well as Schumann's two major personae: the impetuous extrovert Florestan and the pale, studious, introverted Eusebius. The Davidsbündler Tänze (Dances of the Tribe of David) specifically chronicles an emotional and musical journey with these two alter egos at the wheel — but so do most of Schumann's works, especially those for piano. 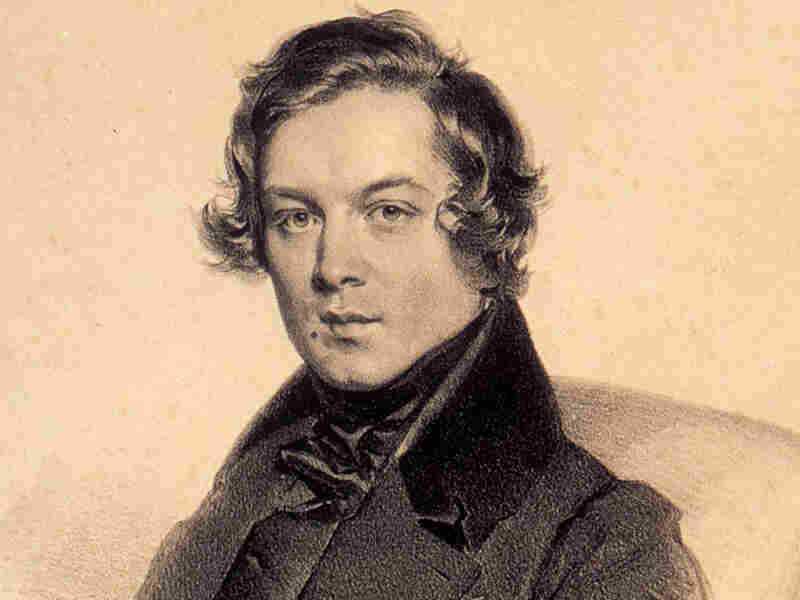 Schumann's lyrical, intense musicality produced some of the most beautiful and moving lieder in the repertoire. His Dichterliebe (Poet's Love), a setting of 16 poems by Heinrich Heine, is his best-known song cycle and a supreme achievement in German lied. Other cycles include Frauenliebe und Leben (Women's Love and Life) and two sets titled Liederkreis (one to poems of Heine, one to poems of Joseph von Eichendorf). There is a substantial amount of chamber music; the best pieces are the Piano Quintet (the first piece ever written for that complement), the Piano Quartet, and the Three Romances for oboe and piano. As a symphonic composer Schumann sports a long rap sheet: awkwardness in larger forms, muddy scoring, excessive doublings that always sound a little out of tune. But he was capable of achieving splendid orchestral effects, and his Third and Fourth Symphonies also reveal original and innovative approaches to form. In an effort to reinforce a feeling of unity in the Fourth Symphony, he specified that its four movements be played without a break, with the aim that the entire work would form a large, cyclical structure. The underlying unity of the piece asserts itself in the treatment of the key and in the thematic linking of the last movement to the first, and of parts of the third movement to the second. The material is so closely knit that musicologists have come to regard it as a landmark in the history of the genre. Of the concerted works, the Piano Concerto is Schumann at his best. The Cello Concerto is a solid piece but the Violin Concerto, a late work of troubled delicacy, requires very sympathetic treatment to be effective. None of Schumann's efforts for the stage has found a place in the repertoire. There is little doubt that Schumann will remain a canonic figure, though if quality of work is the only gauge, his importance has long been overrated. His abilities, at times, fell short of his ambitions, but he brought enthusiasm and a rare poetic genius to everything he attempted. As a critic he was remarkably astute in some judgments, wildly off the mark in others, and in all cases generous. He never became a great pianist, was a failure as a conductor, and at times was not even a very good composer. But his entire being was music, informed by dream and fantasy. He was music's quintessential Romantic, always ardent, always striving for the ideal.